A lot can be said for failure. 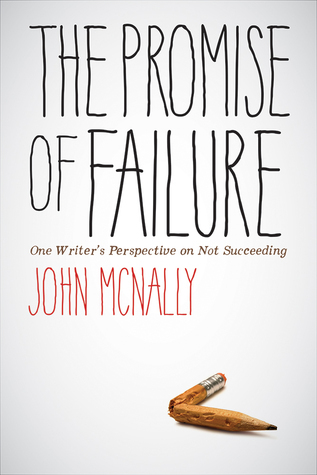 Like most successful writers, John McNally knows what it means to fail and to have to try again. A few years ago, he wrote a Facebook post chronicling his major professional failures as a writer—not his rejected stories or the stories he never finished, but the books that languished in publishing purgatory or were flat-out refused by agents and publishers. The response from his Facebook friends was overwhelming: other writers thanked him for his frankness and shared his post along with their own lists of failures. That post became The Promise of Failure, a slim volume in which McNally explores what it means to fail, and what it means to succeed in a career that doesn’t have a set professional trajectory and doesn’t promise much—if any—financial reward. McNally’s book is not an instruction manual; it’s a guidebook for interrogating your own motives to write, finding your own pain points, and for measuring your progress against your personal expectations, rather than the perfectly curated successes of your social media connections. “Learn what your own strengths and weaknesses are,” he writes, which is good advice not only for writing but for every endeavor you might ever undertake. I don’t get to see my niece very often, but the last time we were together she learned how to walk on the balance beam in a playground near her house. I climbed onto the beam in front of her, my own fear of falling flooding through my veins. What if I fell? What if she fell? We held hands, and held the hands of her mother and grandmother, and crossed the beam one step at a time. What matters, John McNally says, is not how we fail but rather how we process that failure, how we cope, and how we move forward from or with it. In the end, The Promise of Failure is about learning to see the writing life as an adventure and learning how to build your own wings so you can try again.